Beginner friendly, easy to apply coating! 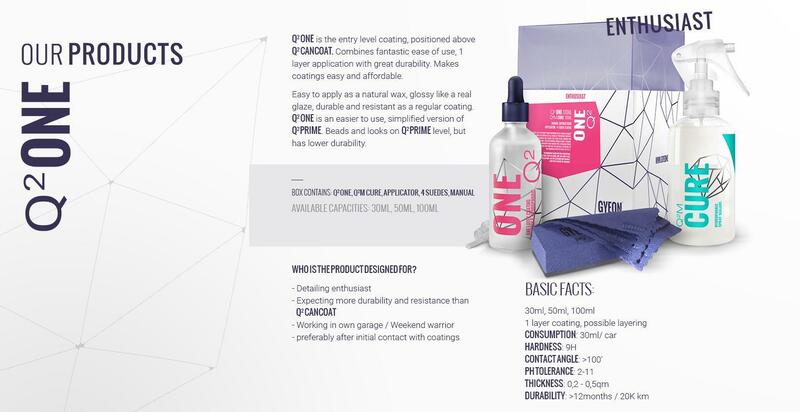 Gyeon One is an easy to apply coating that will help protect your paint, while providing a great deal of gloss! In general, coatings do take a little more effort to apply than a wax and that can be intimidating to some detailing enthusiasts. Gyeon however, really went out of their way to come up with an easy to use formula, that is great for enthusiasts who want more protection and ease of application. According to Gyeon, One is as easy to apply as a traditional wax, provides gloss like your favorite glaze, yet is as durable and resistant as a regular coating. Essentially, you can expect the looks and beading properties similar to that of the other popular Gyeon coatings, slightly less durability but an easier application. With all of Gyeon coatings, you will receive a Applicator Foam Block, Microfiber Suede Cloths and detailed application instructions. Stop dilly-dallying and jump right into trying a coating with the Gyeon One! 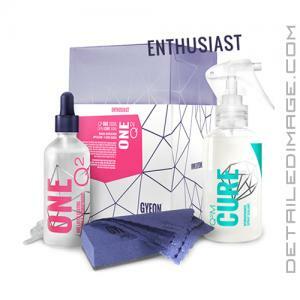 For in-depth instructions on how to use Gyeon One, check out the article How To: Gyeon quartz Q2 One by Jeff McEachran, the national brand manager at Gyeon USA. The easiest way to protect your paintwork with a regular quartz coating. Q2 ONE brings the benefits of all forms of protection together. Easy to apply as a natural wax, glossy like a real glaze, durable and resistant as a regular coating. This fast-curing formula doesn't require any special equipment. Transform your garage into a detailing studio and apply the best protection for your car! The coating is resistant to any chemicals with PH from 2 up to 11. It is the entry level of Coatings in Gyeon and now I understand why.... It is amazingly simple to apply and wipe, every one can do a good job with this product, really a good and awesome coating when you are a beginner or just want a easy fast application of a awesome coating! I just wanted to say thanks again for the quick response and excellent customer service. Also the fast shipping. I love buying from Detailed Image!